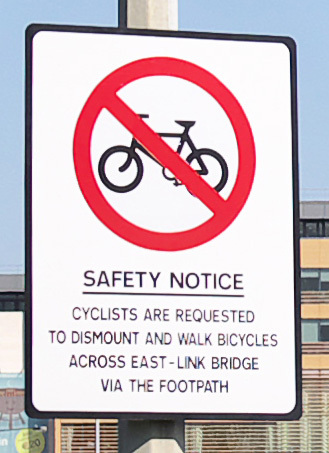 A uniformed garda officer last week was, according to three separate sources, enforcing no cycling signs at the East-Link Bridge in Dublin, despite the signs only being suggestions. MAIN IMAGE & CROP ABOVE: Used with permission from turgidson on Flickr — Copyright (C) All rights reserved. The Garda Press Office said that it has contacted two local stations and they were unaware of any specific operation. Brown said that Egis welcomes comments or suggestions from the public. The bridge — which acts as a type of eastern bypass of Dublin city centre — opened to traffic in 1984 under a public private partnership (PPP) arrangement. It is set to return to the full control of its ultimate owner, Dublin City Council, on December 31 of this year. The council did not respond to a request of comment on the issue of cycling across the bridge. Councillor Ciarán Cuffe (Green Party), who is the chairman of the council’s transport committee, said that traffic should be calmed and cycling encouraged. Mike McKillen, the chairman of Cyclist.ie, was one of a number of people who witnessed a garda officer on duty at the bridge. He said that there was a massive volume of heavy goods vehicles in the area at around 07.40 am on Thursday. Two other reports of the policing of the bridge were recounted on social media, one on Twitter and another on Boards.ie. Egis are the operating company at East-Link, looking after day-to-day tolling and maintenance functions. National Toll Roads Limited (NTRL), which is the name most associated with the bridge, sold off its tolling operations in 2010 — the remainder of the PPP for the East-Link was sold to a Dutch investment fund Dif, while the NTRL operation and maintenance division was sold to Egis. Outrageous. Does this constitute unlawful activity, or just poor judgement, by Gardaí? Dublin Cycling Campaign wrote to NTR several years ago to highlight the unlawful and obstructive nature of these ‘dismount’ signs; the answer was poorly thought-through and inconsiderate. I can unearth the correspondence if you like. Wait. So do I understand right the bridge is actually a private property? So how come Garda is enforcing anything at all then? It’s ultimately public property, built with a public private partnership. I observed the MTB mounted Garda there last Thursday morning at approx. 07:00 h. It was quite clear what his intent was. All riders were pushing bikes on the pavement. As Will Andrews has observed above, Dublin Cycling Campaign wrote to NTR seeking the removal of this quite egregious private notice (non-statutory) and its replacement with ‘Sharrows’ (warning cyclists to control the lane during transit across the bridge and post a 30 km/h speed limit. But of course the road authority and the bridge operator have done nothing. We need a paradigm-shift in how we manage traffic if we are to encourage many more commuters to move to cycling. Garda has to wise-up and begin to understand the real road safety needs of cyclists – dangerous overtaking and inappropriate speed for starters. If this is so dangerous then why not put a speed limit of 20kph on it for traffic? Problem solved without singling cyclists out and that’s possible with a proper road sign. Are guards free to pursue whatever activity they wish during the day? I can understand if a guard is patrolling and taking action when he sees something he doesn’t think is right but it seems like this guard was there for quite a while specifically doing this activity. What did the local station think this guard was doing at the time? If a cyclist was to refuse to follow this guard’s instructions what would their legal position be? Could you be arrested for doing something that is perfectly legal just because a guard told you not to? Isn’t a bunch of cyclists walking their bikes on the bridge going to be pretty disruptive for pedestrians? I’ve never walked across that bridge, but from the road the footpath seems narrow. Not only is the footway on each side of the bridge far too narrow for safety of pedestrians considering the traffic mix using it, it is totally daft to require cyclists to push bikes on the footway thus further narrowing it. Another issue is that pedestrians are within head-strike range of vehicle wing-mirrors on some body types. An ancillary issue is that there is no pedestrian crossing on any arm of the large 2-lane roundabout at The Point junction. If you are attending at a performance at the 3Arena and you want to access it from the southside there is no safe crossing point to the Point! The road authority has quite simply failed to consider the needs of all road users as required by the Road Act, 1993. I hope Cllr Ciaran Cuffe will deal with this once and for all at the Trasportation SPC. Slower speeds please!….no discrimination against sustainable travel modes! @HivemindX I vaguely recall from the road traffic acts or an SI that there’s a requirement to follow the instructions of a Garda. Can’t find the specific legislation right now. Will look later if I get a chance. I cross this bridge every day. How it got planning permission with inadequate/zero pedestrian crossings and no safe provision for cyclists amazes me every time I go over it. It’s an extremely narrow bridge and not one not for the faint-hearted if you’re on a bike at peak hours. Considering the inadequacies of this bridge I often wonder if it was designed by an intoxicated drugged-up intern at the end of an all-nighter at the Fox and Hound. I walk over the bridge every morning and i have to give way to cyclists who are riding their bikes up on the path. Only yesterday morning a young woman and child had to step down off the footpath to avoid two bikes coming from both directions, The footpath is becoming a cycle lane not a footpath. Mark my words someone will be hurt. If you want to cross the bridge using the path you should dismount, if you want to ride your bike use the road.